李法浩, 解国爱, 田荣松, 艾米尔丁·艾尔肯, 李甜, 李治. 华北板块东南缘徐淮推覆-褶皱带的物理模拟[J]. 地质通报, 2018, 37(6): 1087-1100. Li F H, Xie G A, Tian R S, ARKIN Amirdin, Li T, Li Z. 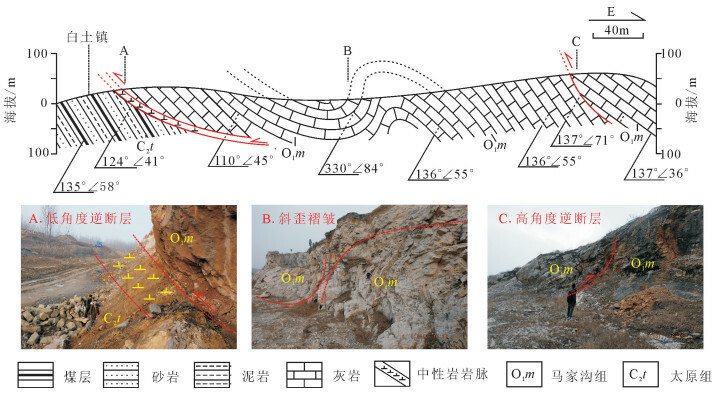 Physical modeling of Xu-Huai thrust-fold belt on the southeastern margin of North China Block[J]. Geological Bulletin of China, 2018, 37(6): 1087-1100. 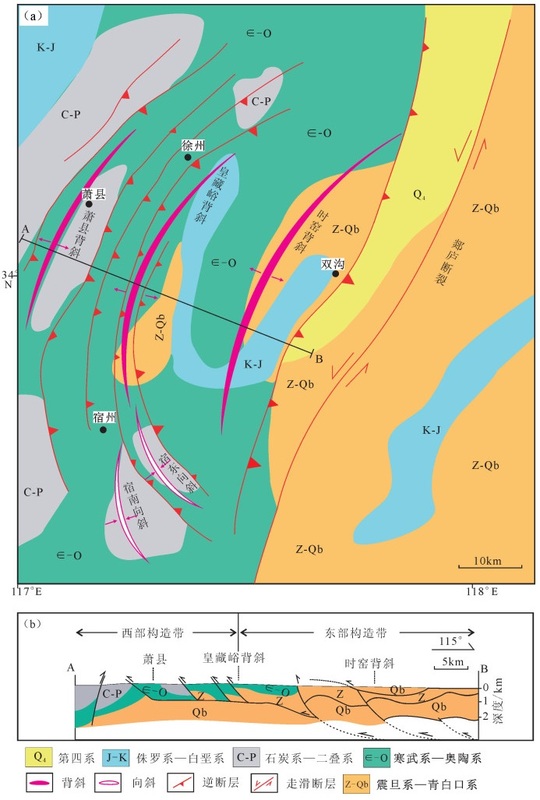 Abstract: Xu-Huai area has developed a series of thrust-fold belts. 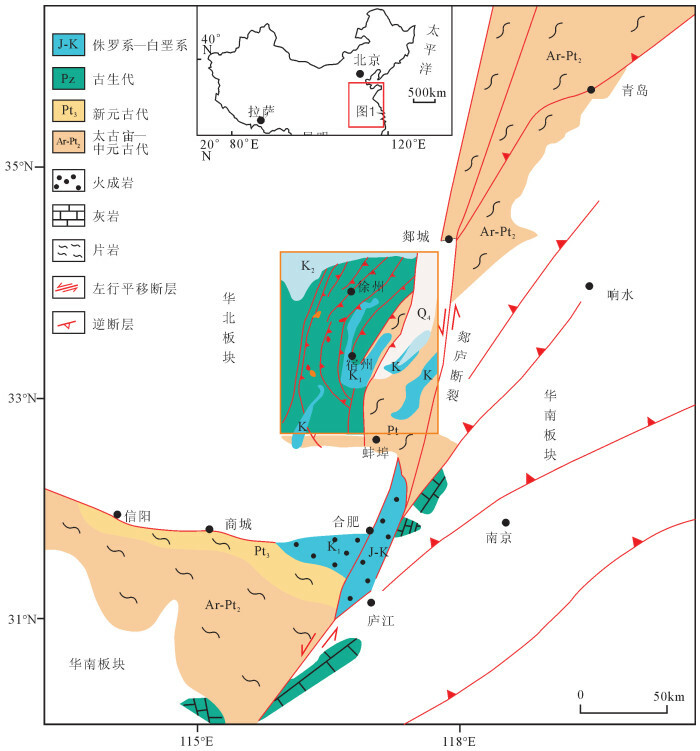 The regional section is divided into eastern and western tectonic zones with obvious structural differences:the eastern tectonic belt mainly shows the characteristics of inclined fold, and the western tectonic belt mainly shows the characteristics of a series of thrusts in style. 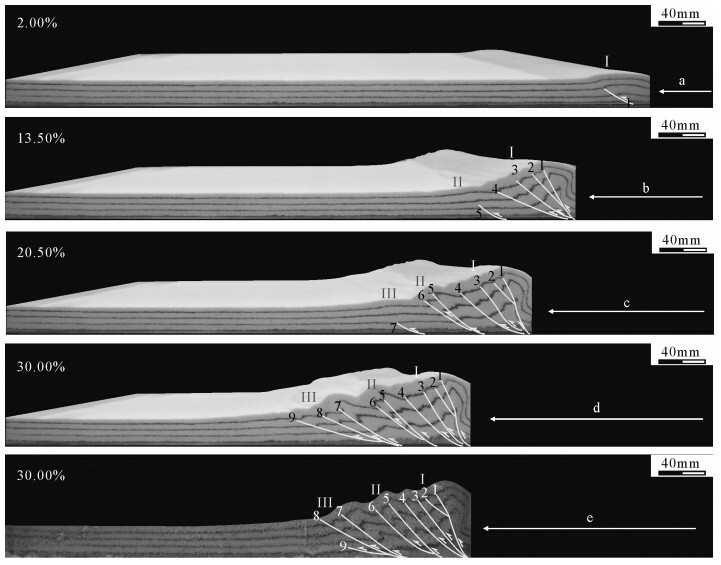 In this paper, the authors studied Xu-Huai thrust-fold belt with the physical modeling method, selected silica gel and micro glass beads to simulate different decollement properties, selected quartz sand to simulate sedimentary brittle cover layer, and changed basal control factors such as friction and decollement depth. The modeling results show that the properties of decollement along the section and the depth change control the regional structural defor-mation. To the east of Huang-Cang valley anticline, main decollement is Upper Proterozoic marl of deep burial depth, and the main tectonic style is characterized by inclined fold; to the west of Huang-Cangvalley anticline, Cambrian shale serves as the decollement, and the decollement is of small depth, with the tectonic style characterized by a series of thrusts. Shu L S, Yin H W, Faure M, et al. 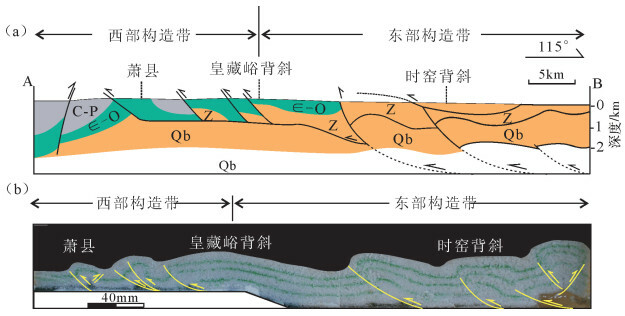 Mesozoic intracontinental under-thrust in the SE margin of the North China Block:insights from the Xu-Huai thrust-and-fold belt[J]. Journal of Asian Earth Sciences, 2017, 141: 7–23. DOI:10.1016/j.jseaes.2016.11.030. 张岳桥, 董树文. 郯庐断裂带中生代构造演化史:进展与新认识[J]. 地质通报, 2008, 27(9): 1371–1390. 徐树桐, 陶正, 陈冠宝. 再论徐州-淮南推覆体[J]. 地质论评, 1993, 39(5): 395–403. 王桂梁, 姜波, 曹代勇, 等. 徐州-宿州弧形双冲-叠瓦扇逆冲断层系统[J]. 地质学报, 1998, 72(3): 228–235. 彭凌日, 舒良树, 张育炜. 华北陆块东南缘徐淮推覆-褶皱带构造变形特征研究[J]. 高校地质学报, 2017(2): 337–349. 周建勋, 漆家福, 童亨茂. 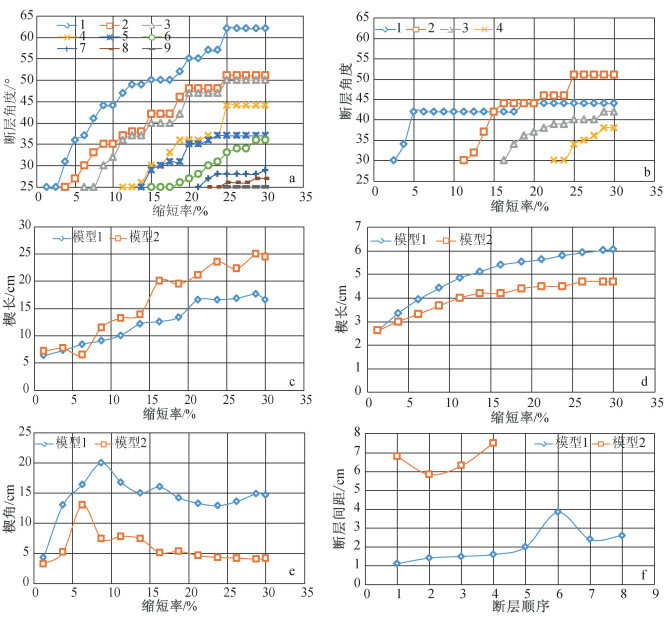 盆地构造研究中的沙箱模拟实验办法[M]. 北京: 地震出版社, 1999. Corrado S, Di Bucci D, Naso G, et al. Influence of palaeogeography on thrust system geometries:an analogue modelling approach for the Abruzzi-Molise (Italy) case history[J]. Tectonophysics, 1998, 296(3): 437–453. Costa E, Vendeville B C. Experimental insights on the geometry and kinematics of fold-and-thrust belts above weak, viscous evaporitic decollement[J]. Journal of Structural Geology, 2002(24): 1729–1739. Philippe Y, Boris J, Frederic M, et al. Dynamic constraints on the crustal-scale rheology of the Zagros fold belt, Iran[J]. Geology, 2011, 39(9): 181–815. Bose S, Mandal N, Mukhopadhyay D K, et al. An unstable kine-matic state of the Himalayan tectonic wedge:Evidence from experimental thrust-spacing patterns[J]. Journal of Structural Geology, 2008, 31(1): 83–91. 黄光明, 李忠海, 李庶波, 等. 底部滑脱层流变性和厚度变化对褶皱冲断带影响的数值模拟[J]. 大地构造与成矿学, 2017(3): 466–480. 汤良杰, 杨克明, 金文正, 等. 龙门山冲断带多层次滑脱带与滑脱构造变形[J]. 中国科学(地球科学), 2008, 38(1): 30–40. 周建勋, 郎建, 刘重庆. 韧性基底层黏度对褶皱-冲断带变形特征的影响——来自物理模拟的启示[J]. 西北大学学报(自然科学版), 2009(3): 392–398. Buiter S J H. A review of brittle compressional wedge models[J]. Tectonophysics, 2012, 530/531: 1–17. DOI:10.1016/j.tecto.2011.12.018. Santolaria P, Vendeville B C, Graveleau F, et al. 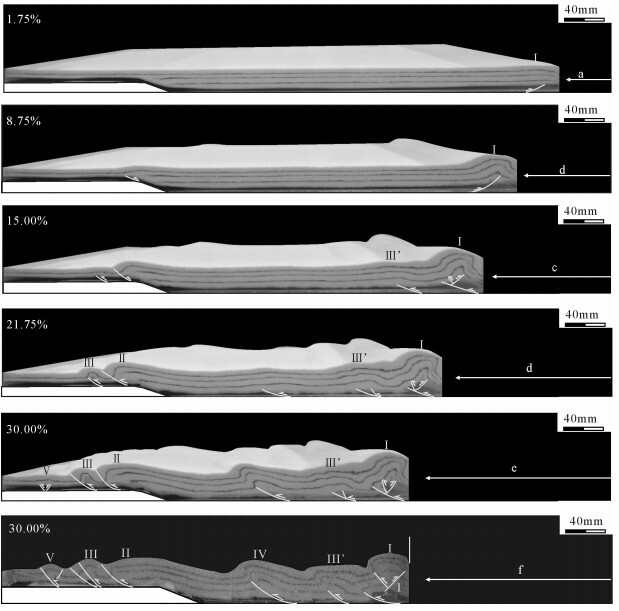 Double evaporitic décollements:Influence of pinch-out overlapping in experimental thrust wedges[J]. Journal of Structural Geology, 2015, 76: 35–51. DOI:10.1016/j.jsg.2015.04.002. Sun C, Jia D, Yin H, et al. 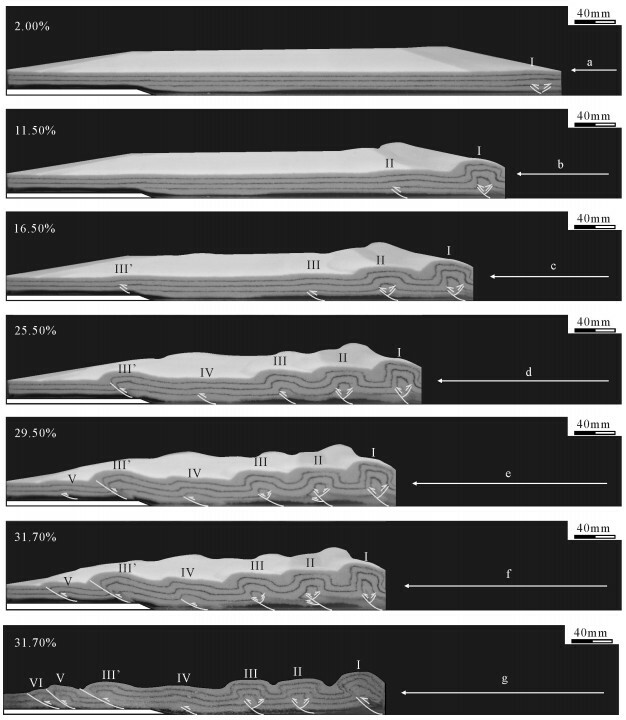 Sandbox modeling of evolving thrust wedges with different preexisting topographic relief:Implications for the Longmen Shan thrust belt, eastern Tibet[J]. Journal of Geophysical Research:Solid Earth, 2016, 121(6): 4591–4614. DOI:10.1002/2016JB013013. 解国爱, 贾东, 张庆龙, 等. 川东侏罗山式褶皱构造带的物理模拟研究[J]. 地质学报, 2013, 87(6): 773–788. 刘重庆, 周建勋, 郎建. 多层滑脱条件下褶皱-冲断带形成制约因素研究:以川东-雪峰构造带为例[J]. 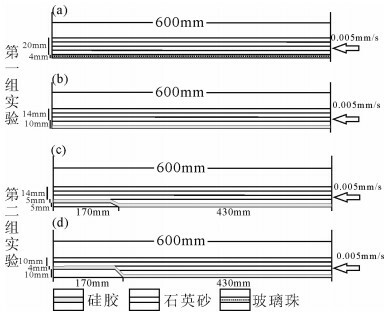 地球科学与环境学报, 2013(2): 45–55. 朱战军, 周建勋, 林壬子. 挤压构造的砂箱物理模拟实验研究现状[J]. 断块油气田, 2002, 9(2): 11–14. 王盼盼, 王陆超, 汪吉林, 等. 徐宿弧形构造对袁庄矿矿井构造的影响机制[J]. 煤田地质与勘探, 2012, 40(3): 18–22. 王陆超, 汪吉林, 李磊. 徐宿地区构造特征及其演化[J]. 地质学刊, 2011(3): 247–250. 余中和, 韩守华, 谢锦龙, 等. 华北板块东南缘原型沉积盆地类型与构造演化[J]. 石油与天然气地质, 2006, 27(2): 244–252. DOI:10.11743/ogg20060216. 舒良树, 吴俊奇, 刘道忠. 徐宿地区推覆构造[J]. 南京大学学报(自然科学版), 1994(4): 638–647. 舒良树, 吴俊奇, Brewer R C. 徐州-宿州地区平衡剖面研究[J]. 中国区域地质, 1996(4): 87–92. 方婷, 解国爱, 王博, 等. 淮北煤田构造特征和形成机制[J]. 煤田地质与勘探, 2017, 45(3): 1–6. 张国锋, 朱伟, 赵培. 徐州矿区深部地应力测量及区域构造作用分析[J]. 岩土工程学报, 2012(12): 2318–2324. 黄泽光, 高长林, 吉让寿. 南华北地区中新生代盆地演化[J]. 石油与天然气地质, 2005, 26(2): 252–256. DOI:10.11743/ogg20050220. Hubbert M. Theory of scale models as applied to the study of geological structures[J]. Geological Society America Bulletin, 1937, 62: 355–372. 赵仕俊, 赵锡奎, 杨少春. 地质构造物理模拟实验模型的相似分析[J]. 西北地质, 2005(4): 14–18. Krantz R. Measurements of friction coefficients and cohesion for faulting and fault reactivation in laboratory models using sand and sand mixtures[J]. Tectonophysics, 1991, 188: 203–207. DOI:10.1016/0040-1951(91)90323-K.
 Lohrmann J, Kukowski N, Adam J, et al. The impact of analogue material properties on the geometry, kinematics, and dynamics of convergent sand wedges[J]. Journal of Structural Geology, 2003, 25(10): 1691–1711. DOI:10.1016/S0191-8141(03)00005-1. Panien M, Schreurs G, Pfiffner A. Mechanical behaviour of granular materials used in analogue modelling:insights from grain characterisation, ring-shear tests and analogue experiments[J]. Journal of Structural Geology, 2006, 28(9): 1710–1724. DOI:10.1016/j.jsg.2006.05.004. Schreurs G, Buiter S J, Boutelier D. Analogue benchmarks of shortening and extension experiments[J]. Geological Society of London, 2006, 253: 1–27. DOI:10.1144/GSL.SP.2006.253.01.01. Konstantinovskaya E A, Rodriguez D, Kirkwood D, et al. 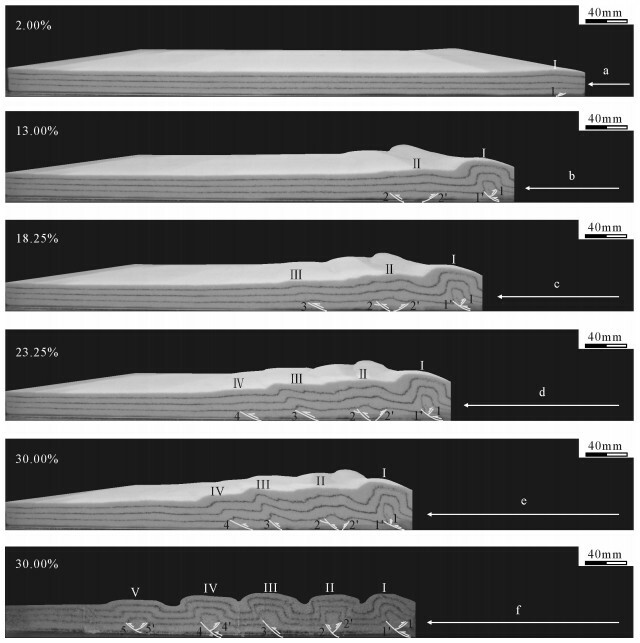 Effects of Basement Structure, Sedimentation and Erosion on Thrust Wedge Geometry:An Example from the Quebec Appalachians and Analogue Models[J]. Bulletin of Canadian Petroleum Geology, 2009, 57(1): 34. DOI:10.2113/gscpgbull.57.1.34. Massoli D, Koyi H A, Barchi M R. Structural evolution of a fold and thrust belt generated by multiple décollements:analogue models and natural examples from the Northern Apennines (Italy)[J]. Journal of Structural Geology, 2006, 28(2): 185–199. DOI:10.1016/j.jsg.2005.11.002. Yamato P, Kaus B J P, Mouthereau F, et al. Dynamic constraints on the crustal-scale rheology of the Zagros fold belt, Iran[J]. Geology, 2011, 39(9): 815–818. DOI:10.1130/G32136.1. Borgh M M, Oldenhuis R, Biermann C, et al. The effects of basement ramps on deformation of the Prebetics (Spain):A combined field and analogue modelling study[J]. Tectonophysics, 2010, 502(1/2): 62–74. Bonini M. Deformation patterns and structural vergence in brittle-ductile thrust wedges:An additional analogue modelling perspective[J]. Journal of Structural Geology, 2007, 29(1): 141–158. DOI:10.1016/j.jsg.2006.06.012. Couzens-Schultz B A, Vendeville B C, Wiltschko D V. Duplex style and triangle zone formation:insights from physical modeling[J]. Journal of Structural Geology, 2003, 25(10): 1623–1644. DOI:10.1016/S0191-8141(03)00004-X. Jackson M P A, Talbot C J. The Shapes of Salt Extrusions[J]. Geological Society of America Bulletin, 1986, 97: 305–323. DOI:10.1130/0016-7606(1986)97<305:ESSRAD>2.0.CO;2. Mulugeta G. Modelling the geometry of Coulomb thrust wedges[J]. Jourmal of Structural Geology, 1988, 10(8): 847–859. DOI:10.1016/0191-8141(88)90099-5. Koyi H. Mode of internal deformation in sand wedges[J]. Journal of Structural Geology, 1995, 17(2): 293–300. DOI:10.1016/0191-8141(94)00050-A. Konstantinovskaya E, Malavieille J. Thrust wedges with décollement levels and syntectonic erosion:A view from analog models[J]. 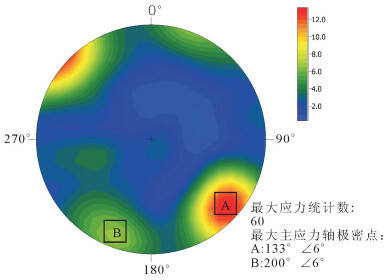 Tectonophysics, 2011, 502(3): 336–350. Dahlen F A, Suppe J, Davis D. Mechanics of Fold-and-Thrust Belts and Accretionary Wedges' Cohesive Coulomb Theory[J]. Journal of Geophysical Research, 1984, 89(12): 10087–10101. Davis D, Suppe J, Dahlen F A. Mechanics of Fold-and-Thrust Belts and Accretionary Wedges[J]. Journal of Geophysical Research, 1983, 88(B2): 1153–1172. DOI:10.1029/JB088iB02p01153. Nieuwland D A, Leutscher J H, Gast J. Wedge equilibrium in fold-and-thrust belts:prediction of out-of-sequence thrusting based on sandbox experiments and natural examples[J]. Netherlands Journal of Geosciences-Geologie en Mijnbouw, 2000, 79(1): 81–91. DOI:10.1017/S0016774600021594. ① 安徽省地质矿产局区域地质调查队. 区域地质报告(徐州幅)(1: 20万). 1977.